Made from the natural amber in rich brown or cognac, this beautiful bracelet is 14 cm in length and is perfect to use as a bracelet of anklet. The bracelet is fitted with a pop clasp, quick release closure for safety. Alternating honey, light cognac, cherry and dark cherry beads make this beautiful bracelet appealing to any age and gender! 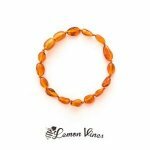 The bracelet is 14 cm in length and perfect to use as a bracelet or anklet. Fitted with a pop clasp, quick release closure for safety.